Things have recently got exciting at the White Rose Shopping Centre in Leeds and it’s thanks to the launch of 5 new restaurants and the addition of a cinema. Let’s be honest, I think that it was getting a little left behind after all the recent expansions in Leeds city centre. One restaurant you don’t want to miss out on is Limeyard, an all day California Kitchen. 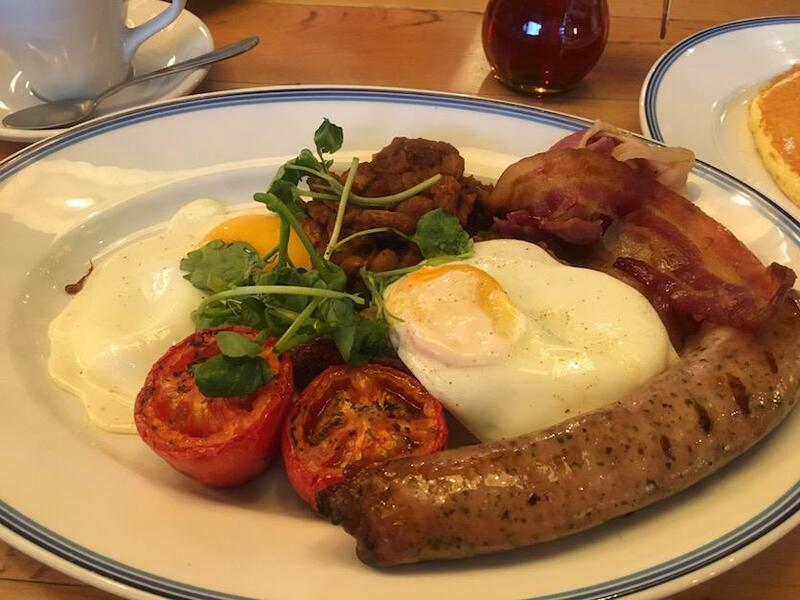 I love to go out for breakfast or brunch and after catching a glimpse of Limeyard’s brunch menu at one of their launch evenings, I couldn’t wait to go back and give it a try. The menu really does have something to suit everyone and it was difficult to choose one breakfast, so for research purposes, I ordered two! I couldn’t resist ordering the Full Yard. You get delicious maple cured bacon, grilled sausage, two fried eggs, roast tomato, house cooked beans, watercress and sourdough toast. As you can see the portion sizes at Limeyard are generous and sure to set you up for the day. The most delicious thing on the plate had to be the grilled sausage and everything was cooked to perfection. If it’s on the menu, you can guarantee that one of us will order Eggs Benedict, so I used my womanly charms to persuade Harry to get it so that I could pinch a bite. 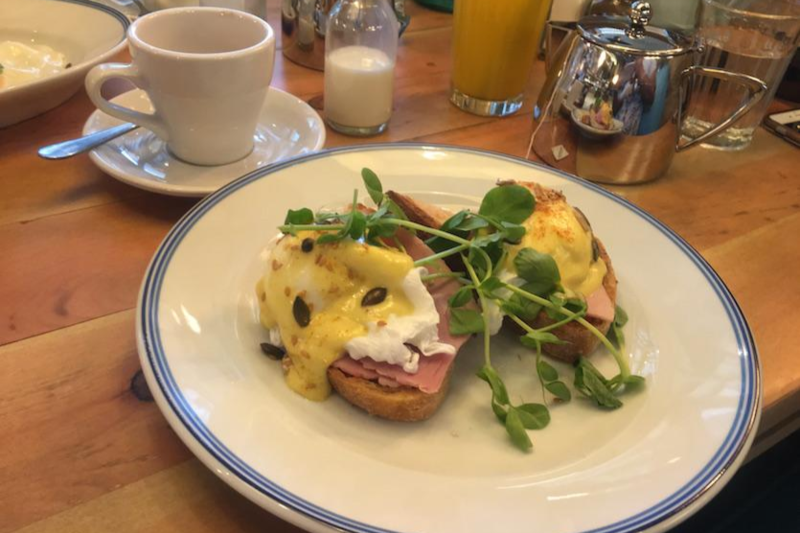 Glazed ham, poached eggs, hollandaise sauce, toasted seeds, pea shoots served on sourdough toast. Oh how I love hollandaise sauce and this one didn’t disappointed. I also thought the seeds were a tasty touch. Harry always has room for a second breakfast, but I was feeling quite full after the Full Yard, so we decided to share the second breakfast. I give you…..Mixed Fruit Waffles. It looked amazing and I can confirm that it tasted amazing. 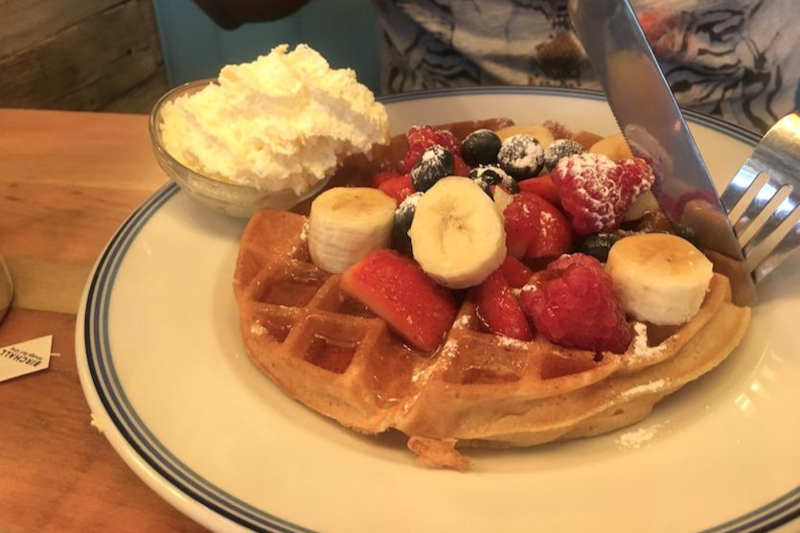 Who doesn’t love banana, strawberries, raspberries, blueberries and maple syrup on top of a golden waffle with a sprinkling of icing sugar and whipped cream??! Overall, a delicious breakfast for a reasonable price and the perfect way to start the day before browsing the shops.